need to hunt for all the pieces of a key, or carefully search for a way forward in an area that appears to be a dead end. The range of environments isn't always the most original, we've seen forest and volcano areas multiple times before in the Zelda series, but the presentation is good and the challenges are well thought out. 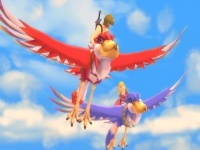 Travelling from one area to another can be a little time consuming, since you have to return to the sky whenever you finish exploring, and then fly around for a bit to reach the next entry point. To help with your exploration, Link now has the ability to dash. Holding in the A button while walking will make Link start running at high speed. 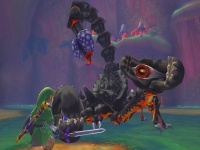 A stamina gauge appears as he does so, slowly depleting until it runs out and Link has to stop and catch his breath. Making good use of dashing can help you navigate the world much more efficiently, and it actually has some practical uses at times, as it allows Link to run up steep hills that are normally inaccessible. 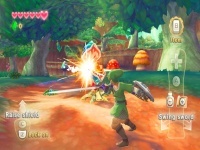 This is one feature that I'd be happy to see future Zelda games take advantage of. 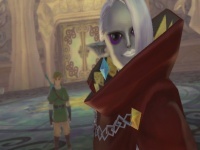 New Zelda: Trailer, Artwork and Screenshots!